Home › Blog › Perfect presents for perfect people! Perfect presents for perfect people! Can you believe that it is December tomorrow-that is officially Christmas in our books. If that makes you panic a bit then don't fret; we've come up with some super little gift combos for you. So now it's super easy to choose and takes the stress out of your shopping, so you have more time to drink mulled wine and scoff mince pies! Just because we're nice we are offering you FREE DELIVERY this weekend on all orders until Monday 2nd December, just enter 'SHIP2013' at the checkout and thank us later! One of our most popular fabrics is the Daschund, it seems to be the dog on trend right now. 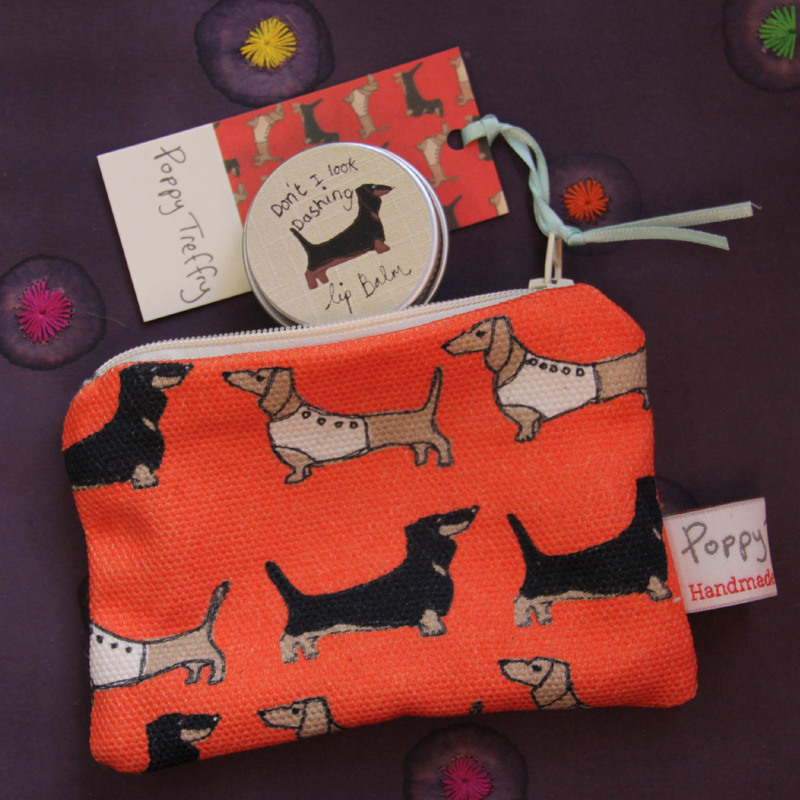 So why not treat your loved one to a cute little purse and a 'don't I look dashing' lipbalm. Click here to have a look. Even if they don't have a daschund, then surely this is the next best thing as you can carry them around in your handbag just like a real one! For all those bicycle lovers there's the big and small useful purses that can be used for storage of many useful things. 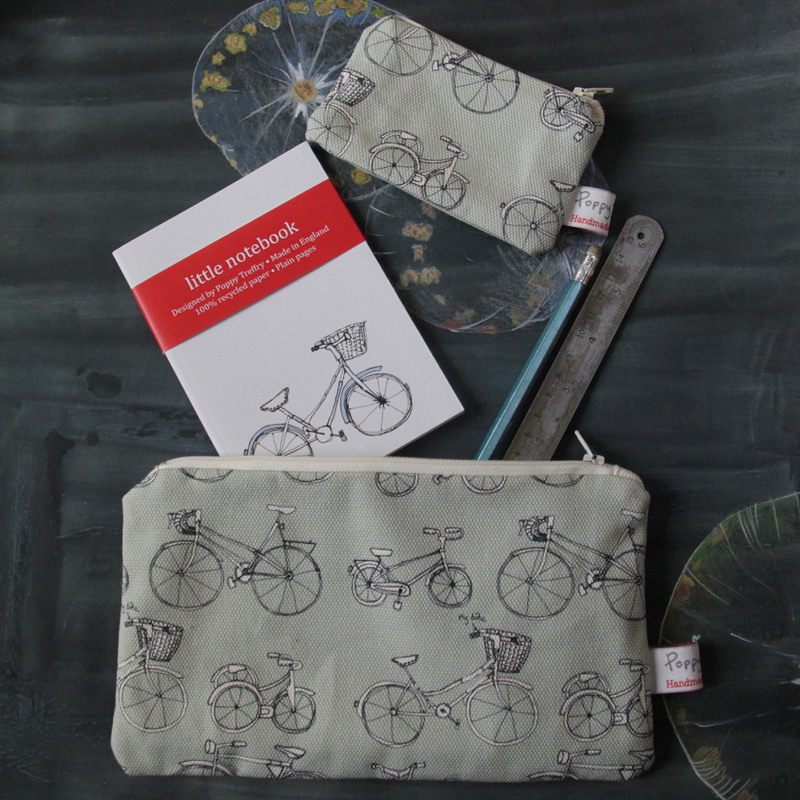 Toiletries, pens & pencils or even all your bike related gubbins! Or there is a notebook for writing down a list of adventures and places to explore on your bike. Buy them here. 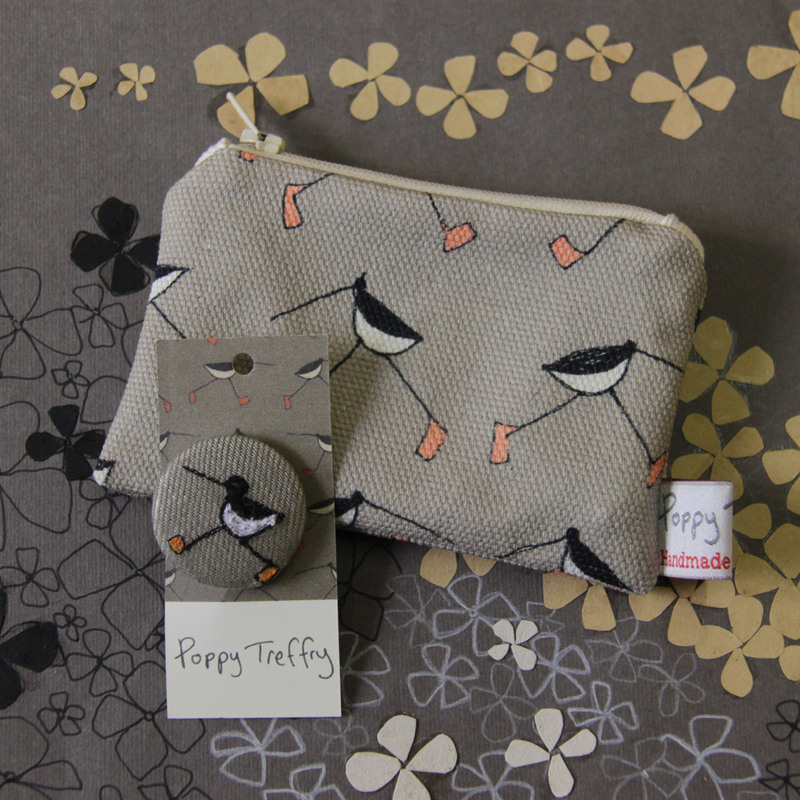 The oyster catcher was one of Poppy's first ever designs and still remains a very popular favourite today. Available on a little badge and useful purses. Catch them here! and for all of the sewers, (we know there are quite a few out there!) 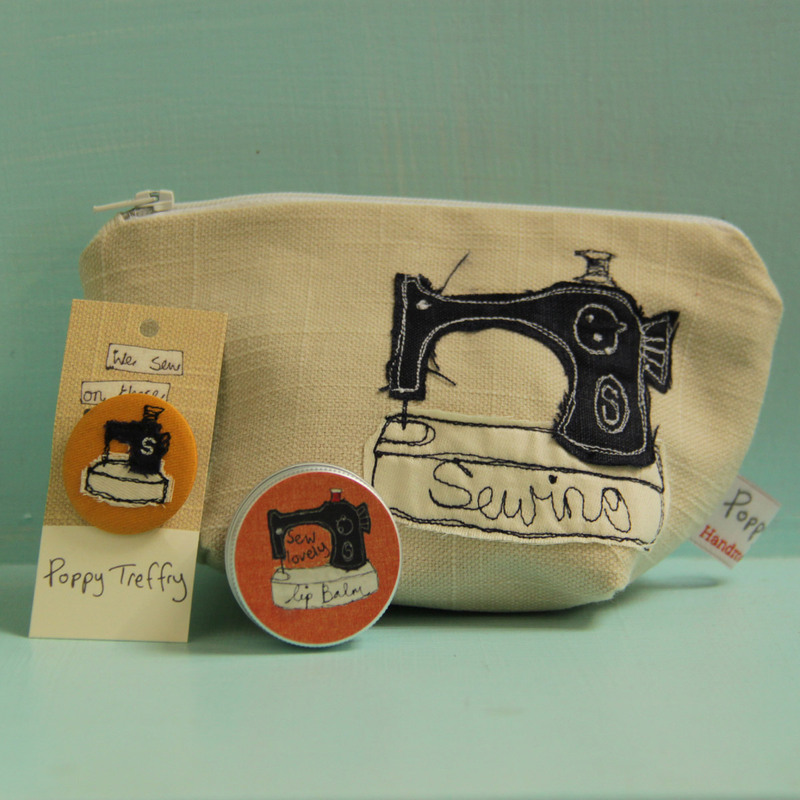 why not treat them to a pretty little sewing purse to store all their needles, threads and treasured bobbins. They could wear an embroidered badge with pride as they happily whip up their latest make and enjoy some 'sew lovely' lipbalm. Take a look at them here. For anyone who loves the coast, and dreams of lazy days on the beach watching the boats trawling by, whilst listening to the sound of the gulls then don't miss our boaty combo set. 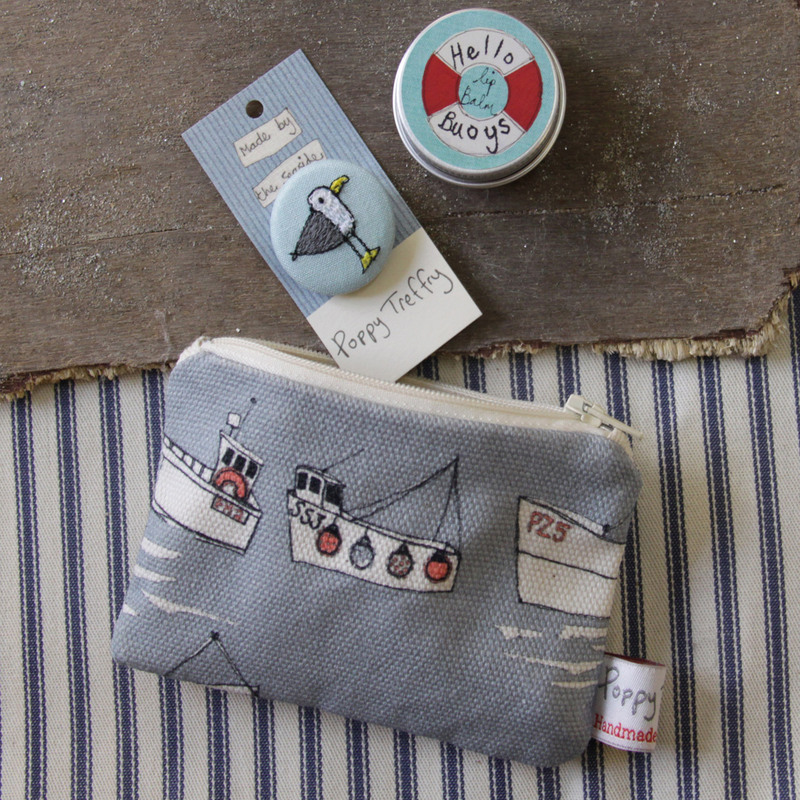 Our flotilla useful purse, embroidered gul badge and cheeky 'hello buoys' lipbalm-the perfect boaty gifts. Click here to trawl it into your basket! Hope we've given you some good ideas for gifts now and do utilise our FREE DELIVERY over the weekend by entering 'SHIP2013' at the checkout. Now I better send the husband up in the loft to dig out the decorations and that ball of tangled fairy lights and get festive!